How about a rich crispy exotic sweet which melts in your mouth? 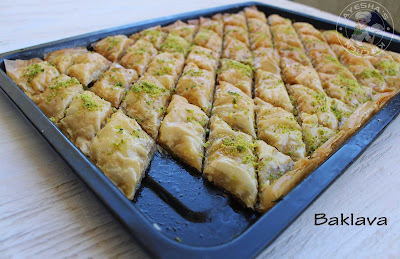 Here it is ...Turkish Baklava or Greek Baklava . 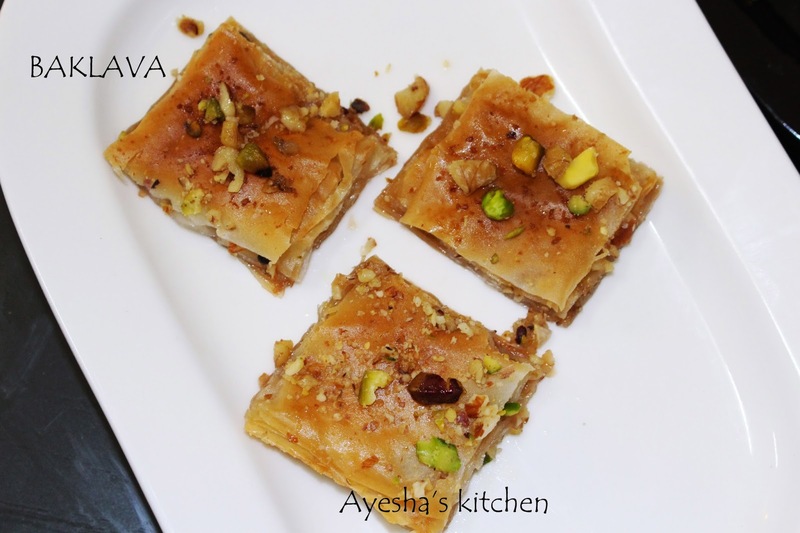 Sweet with numerous layers of phyllo pastry (baklava pastry) and chopped nuts in between. 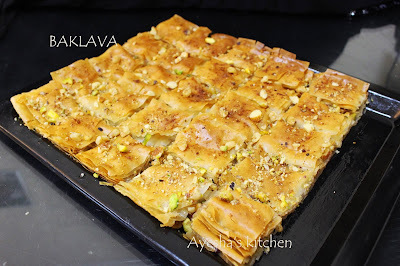 Baklava is a rich sweet made of layers of filo filled with chopped nuts, baked until golden crispy and finally sweetened with sugar syrup or honey. Baklava is a Turkish sweet , cuisine of former Ottoman empire and is also found in central and west Asia. But the history of Baklava sweet is not well documented. Still arguments between Greek and Turks regarding the origin of this rich delicious sweet. It is also widely found in many Arabic and Middle eastern cultures which is generally served on special occasions. So let's see the recipe for baklava dessert or how to make delicious rich Turkish Baklava. 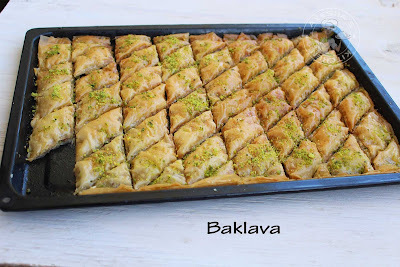 Here is the recipe for Turkish sweets /Turkish dessert recipes /baklava recipe / easy walnut baklava. 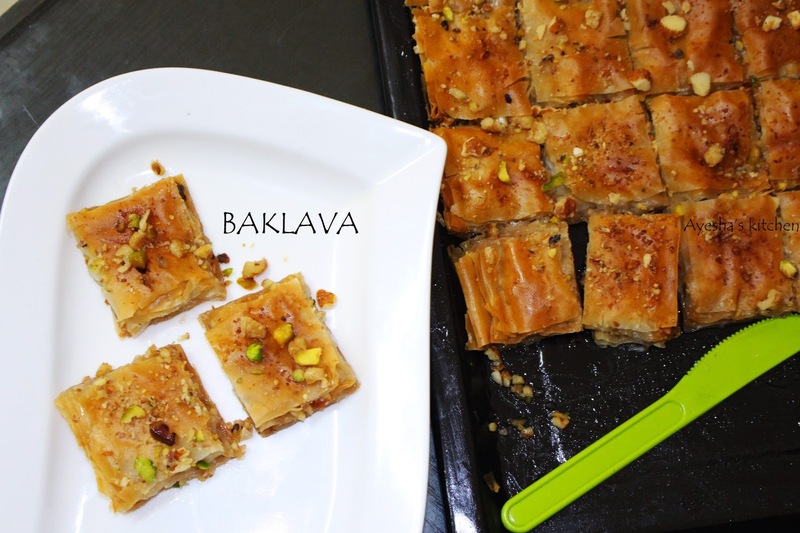 Try this and enjoy the melting crispiness sweet of Baklava. Keep the filo thin sheets at room temperature for half an hour before starting. (let it stay out from freezer for half an hour). Course grind the nuts in a grinder and set aside. You can also use chopped nuts. Brush each layer of sheets with butter after placing on the tray. And continue layering until 7 layers (mine 5 layers only) , brush with butter, then spread the chopped or course grinned nuts, again spread some butter, continue layering 7 more thin sheets or as many as you can. ( do not forget to brush with butter between each filo sheets. When done, cut into desired shapes with a sharp knife. Pour the melted butter over it, in every gap. Place the tray in a preheated oven. Bake in for 20 - 25 minutes at 180 degree C. OR bake until the top of the baklava turns golden. Mean while prepare sugar syrup. Combine water with sugar and bring to boil. Once sugar melts, add lemon juice. Remove from flame. When baklava is done, take out of the oven and pour this syrup over the hot baklava. Garnish with chopped nuts. You can store it in an air tight container for a week.